Who doesn’t want a good night sleep? The Austin Air Bedroom Machine air purifier (HM402) will undoubtedly provide you with the best night’s sleep you’ve had in years. The first bedroom air purifier to be endorsed by the National Sleep Foundation, the Austin Bedroom Machine helps to alleviate nighttime allergy/asthma attacks and reduce sneezing, coughing and snoring, resulting in a sounder, more restful sleep. Quiet yet powerful, the Bedroom Machine HM402 can change out the air in the room up to 2 times per hour and is ideal for large spaces up to 1500 square feet. 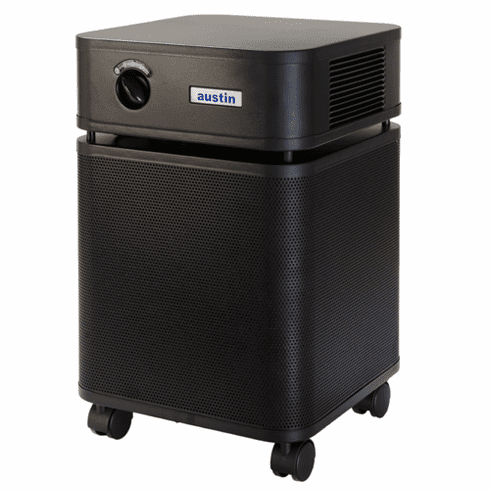 The Austin Air Bedroom Machine air cleaner HM402 surpasses other air purifiers because of the 360º air intake system that allows 250 cubic feet of air passes through the unit every minute. Made of 22 gauge steel, the perforated intake system draws air in from all four sides of the unit, resulting in quicker air delivery back into the room. Safe and effective, the Bedroom Machine HM402 provides you with healthier, cleaner air without producing any harmful ozone. The air is cleansed utilizing a unique 5 stage filter that progressively removes smaller and smaller contaminants from the air. In stage 1, a large particle pre-filter captures particles visible to the naked eye. 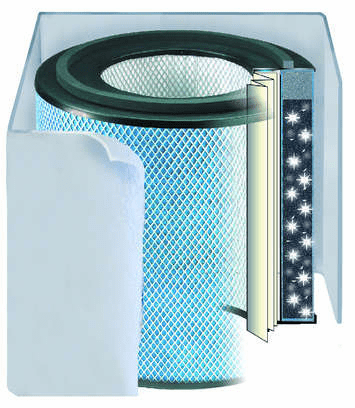 In stage 2, a medium particle pre-filter traps small to medium particles like mold spore, pollen, bacteria and viruses. Stage 3 involves 15-lbs. of an activated carbon/zeolite mixture that chemically binds to and absorbs odors, smoke and VOC’s. In stage 4, 60 square feet of certified true HEPA, the most effective filtering media available, removes 99.97% of all particles down to 0.3 microns and 95% down to 0.1 microns. In Stage 5, high efficiency gas absorbing cloth is used to remove any remaining odors and deliver the most effective relief of nighttime symptoms. For the most efficient air purification, it is important to run your HM402 on high for the first four hours of use and allow for at least a 4” clearance from walls and/or furniture. The HM402 requires very little maintenance. Vacuum the surface with a brush attachment to remove any dust buildup around the air intake area. Other surfaces can be cleaned with a damp cloth. Austin Air offers a 30 day no questions asked, money back guarantee. If you are not completely satisfied with your Bedroom Machine HM402, just return it for a full refund, minus the cost of shipping originally incurred by the seller. Austin Air stands behind the Bedroom Machine air purifier HM402 and ensures that it will be free from all material and workmanship defects for 5 years from the date of purchase. To take advantage of this warranty, the unit must have been used under normal residential conditions and the product warranty registration completed. Austin Air reserves the right to repair or replace your unit. The Austin Air Bedroom Machine air cleaner HM402 has a 5 year prorated filter warranty. With a life expectancy of 5 years under normal residential use, filters from Austin outperform other air purifier filters. Certainly, in environments with higher concentrations of smoke, chemical vapors and soot, the life of the filter could be shorter. The prorated warranty allows you to receive a discount on the purchase of your next filter based on the length of time your current filter was used. Check out the chart below, to see what you could save. Please note that Austin Air does reserve the right to refuse a filter replacement at a prorated price and/or request that the filter be returned for inspection. For large areas up to 1500 sq. ft.
Or Call Today to order! Whether you need whole house air sanitizing or car air cleaners, we have the right solution for you. Besides room air purifiers, we offer an indoor air quality test kit to initially determine how unclean the air in your home might be. Please be sure to read about our Austin Air cleaners, as well as our radon testing kits and our room air sanitizer, too. We will not sell an air cleaner unless it passes our strict field standards. If we have it, then you know it's worthy to be in your home or office, or whatever space you treasure.